Under tremendous pressure from the 9/11 victims families, a few courageous members of Congress and LaRouchePAC, who has championed this story since 2009, the House and Senate Intelligence Committees have finally made public a redacted version of the classified 28 pages of a Joint inquiry which detail Saudi involvement in the September 11, 2001 attacks. These pages, kept hidden from the American people for 15 years, must now be the beginning of a de novo, top-down investigation into the 9/11 attacks and subsequent cover-up. Let this victory be the beginning of a new paradigm of truth and accountability in the U.S. Ever onward! Become a member of LaRouchePAC today! On September 10, 2011, LaRouchePAC published a feature film, “9/11 Ten Years Later” which examines the political, economic and overall geo-strategic motivations of the September 11, 2001 attacks. It's not a secret that the Saudi Royal family is very close to the Bushes. In fact, Prince Bandar bin Sultan, former Saudi Ambassador to the U.S., whose role in 9/11 is highly questionable, is known to many as "Bandar Bush." Perhaps the Bush Administration blocked the release of the 28 pages to defend the KSA, whom they view as a close family friend, a business partner, and political ally. There may be some truth to that. Why then, has the Obama Administration continued the cover-up? While campaigning for president in 2008, Obama promised 9/11 family members that he would finally declassify the 28 pages that dealt with who sponsored the attacks. Then again, in February 2009, when a delegation of 9/11 families visited the White House, Obama made a promise to Bill Doyle, whose son died in the WTC, that he would personally see that the 28 pages be declassified. However, just three months later, on May 29, 2009, Obama ordered Solicitor General Elena Kagan, later an Obama appointee to the U.S. Supreme Court, to file a brief urging the courts to prevent the 911 families from suing Saudi government officials or members of the Saudi royal family on the grounds that they enjoyed sovereign immunity. To this day, Saudi Arabia, the world's leading financier of fundamentalist jihadi madrassases, is considered one of the United States' closest allies. President George W. Bush with Saudi Prince Bandar bin Sultan. "The connection is a direct one. Not only has Saudi Arabia been promoting this extreme form of religion, but it also has been the principal financier, first of Al Qaeda, then of the various Al Qaeda franchises around the world—specifically the ones in Somalia and Yemen— and now the support of ISIS...I believe that had the role of Saudi Arabia in 9/11 been disclosed by the release of the 28 pages, and by the declassification of other information as to the Saudi role and support of the 9/11 hijackers, that it would have made it much more difficult for Saudi Arabia to have continued that pattern of behavior, and I think [we] would have had a good chance of reining in the activity that today Canada, the United States and other countries either are or are considering going to war with." President Obama in Saudi Arabia 2014. July 6, 2016 · Washington, D.C.
With national and international coverage highlighting the significance of the 28 pages in defeating global terrorism—and the Obama Administrations continued stonewalling—Representatives Walter Jones, Stephen Lynch and Thomas Massie introduce H.Res. 779 declaring the 28 pages custody of the U.S. Congress and in their power to declassify them. June 2, 2015 · Washington, D.C.
On June 2, 2015, at a press conference in Washington, D.C., Sen. Rand Paul (R-KY), flanked by former Sen. Bob Graham (D-FL), Reps. Walter Jones (R-NC), Stephen Lynch (D-MA), Thomas Massie (R-KY), and representatives of the 9/11 families, announced that he had introduced S.1471, a bill to declassify the 28 pages from the original Joint Congressional Inquiry into 9/11. The Senate bill is co-sponsored by Sen. Ron Wyden (D-Ore.) and Sen. Kirsten Gillibrand (D-NY). H.Res.14, a House bill introduced in January by Jones, Lynch, and Massie, called for the release of the 28 pages. The press conference was attended by almost all of the major media, and was broadcast live exclusively over LPACTV. Within hours of the event, there was prolific media coverage, giving extensive and generally accurate coverage to the powerful presentations on the urgent need to declassify. All of the speakers—the Senators, Congressmen, and family representatives—singled out Saudi Arabia as the well-spring of the 9/11 attacks and subsequent jihadist terrorism. They all demanded that President Obama fulfill his promise, made on at least two occasions to the 9/11 families, that he would make the full 28 pages public. Audio of the event can be found here. SEN. RAND PAUL: Good morning. Over a decade ago, a bipartisan Congressional Committee investigated the 9/11 attacks, and wrote a report. Twenty-eight pages from that report have never been released to the public. We're here today to call for the release of those 28 pages. The survivors, civilian heroes, and families of the victims of the September 11 terrorist attacks, some of whom are here today, deserve the full truth. I'm not alone in calling for the 28 pages to be released. Over the 13 years since the Report was completed, many have called for the release of these records, including former heads of the CIA, the Republican and Democratic heads of the 9/11 Commission, even the Saudi government continues to favor the release of these pages. The cosponsors of my bill are Senators Ron Wyden and Kirsten Gillibrand. We all are calling today for the release of these 28 pages. We are joined by bipartisan members of the House with a similar bill. I especially want to thank my friend Walter Jones for encouraging me to learn more about this issue. Fifteen of the 19 hijackers were from Saudi Arabia. While their nationality alone does not constitute any wrongdoing by the Saudi government, information that has been revealed over the years does raise questions about their support, and whether their support might have been provided to these al-Qaeda terrorists. For example, according to Senator Graham's book, two of the hijackers appear to have been aided by another Saudi national in the U.S., who, in turn, appears to have been supported by and worked with the Saudi government. We cannot let page after page of blanked-out documents be obscured behind a veil, leading these families to wonder if there is additional information surrounding these horrible acts. We owe it to these families. We cannot let this lack of transparency erode trust, and make us feel less secure. Therefore I, along with Senators Wyden and Gillibrand, have submitted Senate Bill 1471, to declassify these pages. I also intend to offer this bill as an amendment next week, to the Defense Authorization bill. Now I'd like to introduce Senator Bob Graham, who led this Congressional Inquiry, who can tell us more about the development of the Report, and the bipartisan support for releasing the missing 28 pages. SEN. BOB GRAHAM: Thank you, Senator. And thank your colleagues, and those in the House who have already introduced this important legislation calling for the release of the 28 pages. The 28 pages in a Report of over 800 pages, go to the question of who financed 9/11, and they point a strong finger at Saudi Arabia. Since the final report came through the classification process in the summer of 2003, these 28 pages have been withheld from the American people. In my opinion, yes, the 28 pages are very important, and will, I think, inform the American people, and, in so doing, will cause the American government to reconsider the nature of our relationship with Saudi Arabia. But, beyond that, these are emblematic of a pattern of withholding information, unnecessarily, and to the detriment of the American people. As an example: One piece of information which was secured by the work of the victims, those who have suffered the most from 9/11—the sons, daughters, wives, husbands of those who were killed on that tragic day—their efforts have resulted in a trickle of information that better allows us to understand the full scope of 9/11. One of those requests was to the United States Treasury Department, and it related to a Saudi-based foundation, which had a reputation of having been a significant financier of al-Qaeda. The Department of Justice responded. They responded with a report on the information which it had relative to this foundation. Let me just show you what the report said [holds up page after page of totally blacked-out text]. That is what the United States Department of Treasury felt the American people should know about an organization which may well have been a significant reason for 9/11 to have occurred. This is an important issue that goes to the fundamental three words of American democracy—"We the People." This government is a government of the people. People deserve the respect to know what their government is doing in their name. The passage of this legislation will be an important step towards realizing that respect to the people of America. I'd like to again thank Senator Paul and his cosponsors in the Senate, and to call upon Congressman Walter Jones, who has been the leader of this effort in the U.S. House of Representatives. REP. WALTER JONES: Senator, thank you very much. I'm going to speak, and then introduce my two partners on the House side, which would be Steve Lynch from Massachusetts, and also Thomas Massie from Kentucky. And then, after they've made their remarks, I will come up and introduce the family members, and after the families speak, we will open this up for questions. I want to thank Senator Graham for being the driving force of this effort for the truth. What got me started was a book that he wrote years ago about terrorism, and influence of certain Middle East countries. I bought the book. I read it. I called him. I did not know him. We had a great conversation, and I said, "Senator, the truth does matter—to the families, but also to the American people. I'd like to get involved." So, we had a conversation. Then I went down on the House side— you have to make a request of the Intel Committee—and read the 28 pages. About the same time, my friend Stephen Lynch, who will speak next, also read the 28 pages. It's a classified setting. Shortly after that, then Thomas Massie read the 28 pages, and from that, we have been working together to get more and more members on the House side, to join in this effort to give the American people the truth. The families deserve it, and the American people deserve it. To my dear friend Sen. Rand Paul, I want to thank you for taking the lead in the Senate, and getting your colleagues Senators Wyden and Gillibrand to join you in this effort. One of my biggest disappointments has been, on the House side—I can't speak for the Senate side—but we have gotten very few members on the House side, from the areas that were impacted by 9/11, to join us in our House Resolution 14, which simply calls on the President of the United States to keep his word to the 9/11 families, and declassify this information. There is nothing in this information, as has already been spoken to by Senator Graham and Senator Paul, about national security. It's about relationships. The families deserve—their pain has been with them for so long—they deserve the truth, and certainly the American people deserve the truth, or there is no hope for America. So, with that, I would like to introduce my good friend from the state of Massachusetts, Congressman Stephen Lynch. Thank you. REP. STEPHEN LYNCH: Good morning, everybody. I especially want to thank the 9/11 families who are here today, to add such urgency to this effort. Let me thank Sen. Rand Paul for his energy on this, and for bringing a sharper focus to this issue, and I thank your colleagues, Senator Wyden and Senator Gillibrand, for joining you. I'd also like to make special notice of Sen. Bob Graham, because back when very few people were focusing on this, Bob having been part of the official investigation, he singled out the need to make all of this information available to the public. In our request for full transparency, we're joined today by the families of the victims of these tragic attacks on September 11th. Our nation has suffered a tremendous loss, and we're all devastated by the horrific events of 9/11. However, these men and women, these families behind me, their lives were forever altered that day. And we deeply appreciate their persistence in seeking the truth about their families. Our commitment to one another, as citizens, in a society that values freedom and justice, demands that we hold accountable those who aided and abetted the savage attacks on our homeland, and the murder of thousands of innocent Americans. When that fundamental duty to protect American citizens has been breached, it is not enough to say, "We will never forget." We need to do more. The military and civilian personnel at the Pentagon, the first responders and office workers in New York, the passengers and the crew of those hijacked planes, and all those families whose hearts still ache—we owe it them to provide a full accounting of the events and circumstances surrounding the tragedy of 9/11. It is appalling, it is a disgrace, for a country which prides itself on transparency and truth and justice, that these 28 pages of this bipartisan, bicameral, Congressional Inquiry remains classified after 14 years from those terrorist attacks. This is not a mere redaction! As Senator Graham has noted, it is not just the mere deletion of a few words here and there, as is typical in these reports. This is full-fledged blackout of information, of these 28 pages. They have been excised from that otherwise informative report — 28 pages in length. It may have been a matter of national security to secure those pages back in 2002, with the urgency and the fear of vengeance at that time. But it is long since time that we made these reports public. Transparency in government is vital to our democracy. Enough time has passed that we can digest this information without worrying about the visceral passions, and security implications, that existed in the days immediately following those attacks. These families, and our nation, experienced a profound and personal loss. And these families, and our nation, deserve to have their questions answered. The declassification of the 28 pages is an important step towards answering these questions. After personally and carefully reviewing these 28 pages, I believe—and Walter and all the other legislators that have read these—feel confident that these can be declassified without harming U.S. intelligence sources or methods. Indeed, I firmly believe that the information contained in these 28 pages, will better inform our national security protocols, and will better inform our anti-terrorism policy going forward. So I urge my colleagues in the House and Senate—I share the frustration with some members of the House who have not read the report, who have not signed on to this bill, that Walter Jones has articulated. But we need to get this done. We hope many of our colleagues will work with us, to make sure that these pages are declassified in 2015. And again, I want to thank Sen. Rand Paul, for bringing this sharp attention, this sharp focus, on this issue today. And I want to thank these families behind me, for their patriotism, and for their quest for justice, on behalf of their loved ones. REP. THOMAS MASSIE: Congressman Massie from Kentucky. I want to thank Congressman Jones for drawing my attention to this issue, and I want to make three points. First and foremost, the point for the families. The information in these 28 pages, I think, establishes a chain of liability that I think is important for the families in receiving justice. And I, first and foremost, hope those pages are released for the families of the victims. Secondly, this is a bipartisan issue. Unfortunately, bipartisan in two regards. We have Republicans and Democrats in both the House and the Senate who are leading the charge to release these pages; but you had two Presidents, either of which could release them, could have released them. The Republican President who is the reason that they are secret, and a Democratic President who keeps them secret. Tomorrow, or even this evening, the President could release these pages. Our resolution merely urges him to do that. And it's completely within his authority to release these pages, and I want to make that point today. Finally, nearly not a day goes by in Congress, where we aren't discussing about how to prevent another 9/11. Whether it's in the discussion about whether we should collect Americans' phone records, whether we should look at the content of their emails, to what degree do we need more intelligence-gathering capabilities. That's all in the name of preventing another 9/11. Whether we should get involved in Syria, to what degree we should be concerned about Yemen, what to do about Iraq? All of these are colored by the question, How to prevent another 9/11? Some of the best intelligence we have is in these 28 pages, and most of our colleagues in the House have not read them, yet they're pretending to be informed on these issues, and having a discussion about how to prevent the next 9/11—yet turning a blind eye to these 28 pages. And that is another important reason why they need to be released. Thank you. REP. JONES: I'm going to introduce Terry Strada. Her husband lost his life in the 9/11 attack. Terry will introduce her children, who are here, and then other members of the families who have felt the pain of 9/11—that believe that the truth of 9/11 will help them, as they move forward with their lives. So, with that, thank you, Terry, so much for all you, and everyone here today, and those who are not standing with us here, because you've done so much to bring the truth to the American people. TERRY STRADA: Thank you. My name is Terry Strada. I am the national chair of 9/11 Families and Survivors United for Justice Against Terrorism. I'm here today with my three children, Thomas, Kaitlyn, and Justin. I'm also joined by some family members and survivors from 9/11. With us today we have Abraham Scott, who lost his wife Janice in the Pentagon. We have Mary Ellen Salamone and Aidan Salamone—they lost their husband and father on 9/11. Next you have Emanuel Lipscomb; he is true treasure. He is a civilian hero. He saved many lives on 9/11 down at the World Trade Center. We also have Matt Sellitto. Matt lost his son in the North Tower of the World Trade Center. And we have with us today a New York fireman survivor, Mike Hadden [? ]—he's with us as well. Thank you all for coming to be with us today. Many people believe our suffering is in the past, and future attacks are diminished. Neither is true. Our loss is for the rest of our lives, and so is the real threat of another terrorist attack. We are forever united in our grief, and our commitment for a safer nation. I've been outspoken on the topic of terrorism financing for several years, because I have lived through the devastation of terrorism, and continue to live with the battle scars today. I lost my husband Tom Strada and dozens of dear friends and colleagues on 9/11. Every single person that Tom worked with, was killed that day. If I had the strength, I could easily have attended well over 25 services and funerals. To this day, we have not been able to lay my husband to rest, because he has never been identified and returned to us for a proper burial. So, yes, like all of the members here today, I know a lot about the pain and suffering of terrorism. For the sake of the American people, not just those who suffered injuries or had their families ripped apart, but for all Americans, the entire truth about who attacked us on 9/11 needs to be aired. We cannot properly secure our future if we remain kept in the dark about what foreign country or countries helped facilitate the attacks. And yet, here we stand, more than a decade later. Despite the availability of additional information on this subject, secretted in a guarded vault beneath the Capitol, only steps away from where we stand today, we remain almost universally uninformed. Based on what little we do know about what is in those 28 pages, we are confident that declassifying them will prove to be critical to unraveling the Saudis played in the worst terrorist attack on American soil. There is nothing conspiratorial or hidden about the ultimate responsibility for the horrific terrorist attack that led to the incineration of almost 3,000 souls. Nearly every significant element that led to the murderous attacks on September 11, points to Saudi Arabia. Bin Laden was a member of the Saudi elite. His father and much of his family had been close associates of the family monarchy for decades. Fifteen of the 19 hijackers were Saudi nationals. The very ideology, Wahhabism, that set the attacks in motion, has thrived in Saudi Arabia since the inception of the Kingdom, and when the money trail is followed, it almost always leads back to Saudi Arabia. Saudi Arabia is influential because its oil and vast wealth make it powerful in the Middle East and beyond. Money is the lifeblood of terrorism. Without money, 9/11 never could have happened, ever. But it is not financial resources alone that make it such an important player in the reign of terror we are witnessing worldwide. The ideology of al-Qaeda and ISIS draws a great deal from Wahhabism, often referred to as radical Islam, and it's now taking over mainstream Sunni Islam. Many banks, charities and wealthy Saudis, are not only responsible for financing terrorist organizations, but in one country after another, they are putting up the money that makes possible the training and the radicalizing of individuals in spreading their violence-inspiring Wahhabi-bred ideology into far-reaching places around the globe, including here in the United States. All people flocking to join ISIS are not necessarily doing so because of lack of economic opportunities. On the contrary. Many of the new recruits are well-educated and economically secure. It is the fanatical ideology that they have given their lives to. The expression of their fanaticism in terrorism is a major threat to our, and other peoples', safety. The war on terror cannot be won until we hold accountable the terrorist financiers for their role in propagating that violent ideology, and for facilitating terrorists and terrorist organizations, that are slaughtering innocent people in the Middle East, and vowing to kill us and destroy us here at home. You should not have to take my word for it. Let's look at what is in the 28 pages. Since these highly respected government officials have repeatedly said that the release of the 28 pages poses no threat to national security, we believe that hidden details of that chapter should be not kept a secret, but should be accessible to inform all of our views. My husband's murder, and the murder of all our loved ones, cannot be the price we pay for doing business with the Saudis. Nor should that price ever be repeated, especially simple for the sake of our so-called friendship. On behalf of all 9/11 family members and survivors, I thank Senator Paul for introducing this vital piece of legislation; former Senator Bob Graham, for his tenacious dedication in pursuing the truth; and also Congressmen Massie, Lynch, and Jones. And we call on all members of the Senate and the House to please join us here today, in our request to declassify the 28 pages. Without the truth, there is no accountability. Without accountability, there is no justice. Without any of these, we can never be safe. And now I'd like to introduce my daughter Kaitlyn. KAITLYN STRADA: Hello. My name is Kaitlyn Strada. On September 11, 2001, along with thousands of people across America, my father left for work. Only, tragically, he never came home. By 2 o'clock, terrorists had taken his life, and the lives of nearly 3,000 other innocent men, women, and children. My father was a successful bond broker, a trusted friend, but most importantly, he was a great family man. We miss him every day. My brother Thomas was 7, I was 4, and my brother Justin was just 4 days old on September 11. On that horrific day, our lives were painfully changed forever. When the smoke cleared and the fires were extinguished, nearly 3,000 children were left mourning the death of their murdered parent. We were young and innocent, without a care in the world one day, and then terrified and heartbroken the next. We experienced the hell, fear, and trauma of terrorism firsthand. We are the children of 9/11. I stand here today with my family, and my extended 9/11 family, and before all of you, asking our President to declassify these 28 pages, which hold the truth about who is responsible for our pain and suffering. Who helped Osama bin Laden and al-Qaeda carry out the heinous attacks on our country, that took our parents away? That question haunts me, and will continue to haunt me until these 28 pages are declassified. Children should not have hearts broken, their dreams destroyed, and their lives shattered. When my father was killed, something was taken from all of us: our innocence and our trust. 9/11 children are growing up in a world where we can't trust our own government, because too many truths remain hidden about who was ultimately responsible for the murder of our parents. Please, Mr. President, on behalf of all the children who are growing up without a parent because of terrorism, help us regain some of what we lost. We respectfully ask that you please declassify the 28 pages, and allow us and the world know the truth. JONES: Abraham, did you want to say something? ABRAHAM SCOTT: I'm not getting any younger. Good morning, everyone. I'm not here this morning to beat up on you about President Obama's promise, or Senator Paul or Congressman Jones' promises to declassify the 28 pages. I'm here this morning to let you know that each morning and night, I ask the Lord to allow me to live long enough so that one of my two granddaughters, Angelese [ph], who is 8 years old— and Mary who is 20 months old—should ask me, "Grandpa, what was significant about 2015?" And I'm hoping that I'll be able to tell them that this Congress, as well as President Obama, passed a law that declassified those 28 pages. I just hope and pray that I will see that day. And I'm also concerned about other family members who are up in age, and having some trials and tribulations in different ways with grandchildren, Bill Doyle and Rosemary Dillard. I'm hoping that hoping that this will come to reality before we all pass. This is not a political thing, not to prove that it's the right thing to do. I beseech both the Congress, as well as President Obama, to please pass this bill, and I want to thank Senator Paul, Congressman Massie, Congressman Jones, and the rest of the Congressional people who support this proposal. I wish you Godspeed. And hopefully next time we meet, at least Congress will have passed an appropriation, that will then go to President Obama's signature. Thank you. Godspeed and God Bless. SEN. PAUL: We'll be happy to take a few questions. Q: Thank you, sir. My name's Barry Kissin. Bob Graham has on a number of occasions been more specific about how this money was being funneled. He refers to the Embassy of Saudi Arabia. My question to you, or Bob Graham for that matter – is Senator Graham aware of who was the ambassador to Saudi Arabia, at the time of this involvement on the part of embassy? Q: Right, Prince Bandar. Now, is the same fellow who George W. nicknamed "Bandar Bush" because of his longstanding affiliations with the Bush family? Is it the same one? GRAHAM: I only know of one Prince Bandar. Q: [followup] One other question. If Senator Paul wanted to, couldn't he get up on the floor of the Senate and read these 28 pages into the record, with impunity? PAUL: Those are the rules. Next question. Q: Yes, I wanted to ask Senator Graham, would he consider running for President? Q: You could appear live in the Democratic debates on national television and make remarks about this problem? GRAHAM: Well, first I certainly understand your sense that there's been a paucity of candidates thus far, [laughter] and we need more to step forward. Two, I think there will be someone in those debates, who might have a question or a response that would touch the 28 pages [references Sen. Rand Paul], and I don't think it's necessary to have a second one and I am enjoying retirement. Q: Wayne Madsen, WMR. Senator Paul, you mentioned that there was some support from Saudi Arabia for declassification of these pages. And King Salman was the Governor of Riyadh before 9/11 and there were reports that he facilitated al-Qaeda members' passage through Riyadh on their way to Pakistan and Afghanistan, with money, logistics, travel support. So, would he be included amongst these Saudis who are in favor of releasing—? PAUL: I don't have in front of me the quote, but it's from someone in their government, I think within the last year, there has been a quote, plus quotes in the past in support of releasing the 28 pages. Q: [Jeffrey Steinberg, EIR, unidentified] A question for Senator Graham: I understand that since the issue of the 28 pages, that there've been new revelations in Florida that further tend to point to the role of the Saudis, and that there's action by a Federal judge, and that there's been some documents released. And you've suggested that the situation out in San Diego and now in Sarasota, Florida, begs the question of other locations—Herndon, Virginia; Paterson, New Jersey—all of the places. Could you elaborate a bit on that, please? GRAHAM: Well, the hijackers lived in a few locations for an extended period of time, in some numbers. We know a lot about San Diego. We are learning about Sarasota, but encountering very similar obstacles to getting access to information there. I do not know what the status of investigations in places like Herndon or Great Falls [virginia], or Paterson have been. Whether there were investigations—I assume there were—what results that they reached. To me, there are two basic questions. One, the one that Porter Goss, the co-chair of the 9/11 Congressional Joint Inquiry has asked: if these 28 pages are going to be withheld, what is the reason they're going to be withheld? At least we ought to have a debate over the validity, the strength, the rationale, behind the decision not to release. And then, if they are released, then the debate will be, what do these pages tell us, and what policy adjustments should we make, based on this new reality of the truth of our relations with Saudi Arabia? STRADA: Excuse me, I've been asked to introduce a family member who'd like to give a very brief statement, and we will continue with questions after that. So, this is Matt Sellitto. MATTHEW SELLITTO: Thank you. Good morning, my name is Matthew T. Sellitto: My son Matthew C. Sellitto was murdered by terrorists on Sept. 11th. First, I want to thank Senators Paul, Gillibrand, and Wyden for introducing the Transparency for the Families of 9/11 Victims and Survivors Act. It will finally help to close the Congressional gap in our 14-year struggle for the whole truth about 9/11. Thank you, Sen. Bob Graham, for your extraordinary commitment to all of Americans, and to us, and the truth. We have been fighting for this cause up and down the East Coast. And to Representatives Jones and Massie, and to my fellow Bostonian, Representative Lynch, for their House amendment, H.Res.14. I would also like to thank the media here, today. We need you. You are the oxygen that disseminates the story and gives this vital issue life. Please, keep it alive, in front of all Americans, until the 28 pages are declassified. This 14-year coverup must end now. It must not survive another administration. Today, our members of Congress are making critical foreign policy and national security decisions in the absence of the information contained in the 28 pages, because they have never read them. How is this possible? As long as those implicated in the 28 pages are protected via classification, we will be very vulnerable to their treachery, their terrorism, and their war. Just look at what has happened in the Middle East: Fourteen years on this, they continue with total impunity. Furthermore, those who helped them by allowing the shameful coverup, are complicit. Finally, let me remind you that the plane that came down in Shanksville, forty souls took that plane down, because that plane was coming here, gentlemen and ladies, to Congress, and many more lives would have been taken, and those lives could have been these Congresspeople. And these people have a right to know where that money came from. Who financed the people to have their lives taken? I would also, finally, like to thank all the people that put extra-hard work in putting all this together. Thank you very much: and please, please, let these people know what is contained in those 28 pages. Mr. President, we're putting an olive branch out to you, President Obama, we're putting an olive branch. We come to you today: Come over to our side, the side of justice, please. PAUL: We've got time for about two more questions, right here. Q: Thank you. So a lot of this effort really depends on President Obama. And I'm wondering Senator Paul, if President Obama stands in the way, will you consider exercising your Constitutional rights to enter them into the Congressional Record, as you acknowledged you could do? PAUL: We're going to try the normal legislative procedure first, and see how it goes. I will bring it up with the President, and I will ask him directly if he will do this. Back there, the young lady. Q: By declassifying these pages, are you essentially saying that the special relationship between the United States and Saudi Arabia could be called off? And then how do you see this impacting the foreign policy in the Middle East? PAUL: You know, I see this more as just a search for the truth, and both Republicans and Democrats, those who were in charge of the inquiry, they all said at the time they would like to see it released. The heads of the 9/11 Commission also say it should be released; former heads of CIA have said it should be released. And in our bill we also allow them to look at it, and if they think there's some kind of ongoing investigation where a name or something like that has to be redacted, we give them the freedom to actually redact it. We just don't want the whole thing to be black, like Senator Graham showed us, when it is redacted. We've got time for one more for a journalist, right back there. Q:[name inaudible, Al Jazeera] Just wondering, how does this affect the lawsuit that the 9/11 families have against the Saudi government? PAUL: I don't have a good answer. Does anybody want to answer that? STRADA: Well, to our lawsuit, how would it affect it? It would just be bringing out the truth that we need. It would just be more proof: We have an abundance of evidence, and this would just be one more piece to that. PAUL: Thanks everybody. If you want individual questions, people will be around afterwards if you want to ask them. Thanks for joining us here today. In the third Capitol Hill Press Conference on the 28 pages, held January 7, 2015, former Senator Bob Graham joined H.Res.14 co-sponsors Walter Jones and Stephen Lynch. On Wednesday, January 7, at 9:30 am EST, Representatives Walter B. Jones (NC-3), Stephen Lynch (MA-8), Senator Bob Graham (D-FL), and members of 9/11 Families United for Justice Against Terrorism, held a bipartisan press conference on H. Res. 14, a resolution calling on President Obama to declassify the 28 pages of the Joint Inquiry into Intelligence Activities Before and After the Terrorist Attacks of September 2001 that were initially classified by President George W. Bush and have remained classified under President Barack Obama. Senator Graham was the chair of the Select Committee on Intelligence when the Joint Inquiry was written and has repeatedly called for the 28 pages to be declassified. H. Res. 14, introduced in the 113th session as H. Res. 428, states that declassification of the pages is necessary to provide the American public with the full truth surrounding the tragic events of September 11, 2001, particularly relating to the involvement of foreign governments. Two days later, on January 9th, as a follow up to this historic press conference, LaRouchePAC aired a live webcast featuring EIR's Jeff Steinberg, who provided the definitive story behind the 28 pages, what is known of the Saudi involvement in the September 11, 2001 attacks and perhaps most explosively, discussed the British role in establishing a slush fund with the Saudi Monarchy for financing terrorism worldwide. This webcast, aired Friday, January 9th, in combination with the January 7th Capitol Hill press conference on the 28 pages, provides the most definitive account of the September 11, 2001 attacks to date. MATTHEW OGDEN: Good evening. It's January 9, 2015. My name is Matthew Ogden, and I would like to welcome all of you to our weekly broadcast here at larouchepac.com for our Friday night webcast. This is at the end of a truly historic week, and I think this will be a very important show that you're watching here tonight. I'm joined in the studio by Megan Beets from the LaRouche PAC Basement Team, as well as Jeffrey Steinberg from Executive Intelligence Review. Now, I'm going to begin tonight's broadcast by reading our institutional question for the week, but I'll directly follow this with something before I invite Mr. Steinberg to the podium to address this question. The question reads as follows: "Mr. LaRouche, how do we deter, counter, and deal with the type of radical Islamist Salafist terrorism that we have seen in Paris this week, and previously in such incidents as the Mumbai attacks of late 2008, and of course the 9/11 attacks? In some instances, these attacks are blind terrorist attacks targeting innocent people and aimed at tearing down the fabrics of democratic societies and cultures. Thank you." Now, before I invite Jeffrey Steinberg to come to the podium to deliver what Mr. LaRouche's answer is to this question, I'm going to show a short clip from what was a truly historic press conference that occurred this past Wednesday on Capitol Hill in Washington, D.C.; which both Jeff and I had the opportunity to attend. This press conference, which bears directly on the answer to the question which you just heard, was hosted by Representatives Walter Jones from North Carolina and Stephen Lynch from Massachusetts, who are two of the primary sponsors of H.Res.14, the newly re-introduced resolution demanding the release of the classified 28 pages of the Congressional Joint Inquiry Report on 9/11. This press conference featured the former co-chair of that Congressional Joint Inquiry, Senator Bob Graham from Florida; as well as featuring Terry Strada, who's the national co-chair of the 9/11 Families United for Justice Against Terrorism and other representatives of the 9/11 families. This press conference occurred literally hours after the initial attacks on the headquarters of Charlie Hebdo in Paris, which I think placed the proceedings of the press conference in their proper scope of sobriety and extreme urgency. As you'll hear from Senator Graham, in his remarks, these attacks really must be seen as the direct consequence of the cover-up by both the Bush and the Obama administrations of the truth about who financed and who organized the attacks on 9/11; making the issue of declassifying these 28 pages not merely a question of setting the historical record straight, but one which has direct bearing on the present peace and security of the world. As Senator Graham says, "it is as current as the headlines which we will read today." So, I'd like to play this video for you now, after which I'll ask Jeffrey Steinberg to come to the podium. First you'll see Representative Walter Jones give a short introduction, followed by some key excerpts from Senator Graham's speech. "WALTER JONES: ... Senator Bob Graham spent 18 years in the Senate: He's a man that has the nation's respect, for the type of person that he is. He and Senator [richard] Shelby released the Joint Inquiry Report into 9/11 in December of 2002. 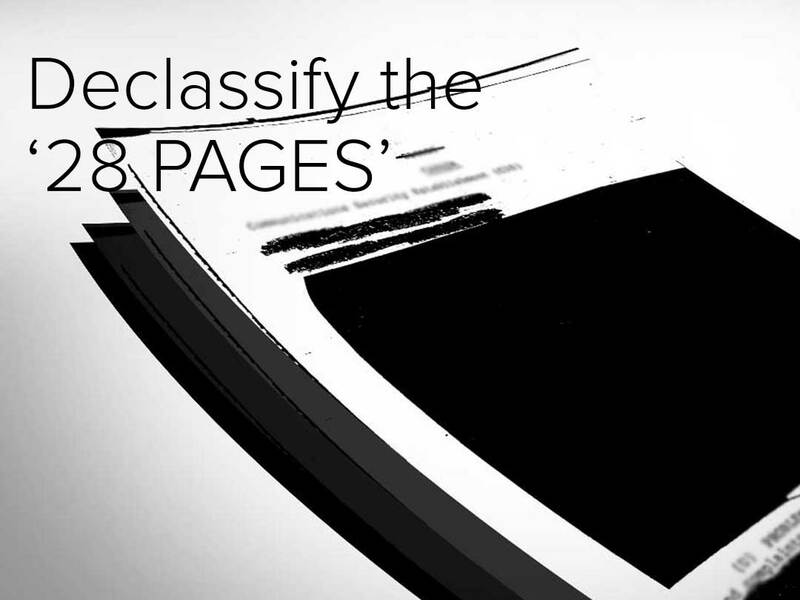 Again, the report goes to the White House for final review, the White House, at that time under George Bush, decided that the 28 pages should be classified. "The families have suffered long enough. The American people have been denied the truth long enough. It is time for the truth to come out. It is time for the truth to come out. As Stephen said, I want to thank Sen. Bob Graham. He has a daughter who was sworn in to the United States House of Representatives yesterday, and congratulations on that Senator. With that, a man who has driven this issue, since 2002, I'm not even going to begin to tell you what he has done! From court action, to other types of action, because he knows that the truth will set America free! "SEN. BOB GRAHAM: Walter, thank you very much. Thank you, very much. And I, too, want to thank Walter and Steve—Congressmen Jones and Lynch—for their leadership in bringing this matter to the attention of the Congress. I want to thank the family members, who have been without question the most influential force in all of the changes that have occurred as a result of 9/11, and will be the most significant force in terms of convincing the President that it is time to give the American people the truth. "One, is a denial of the truth. A core question in 9/11 is, did these 19 people act alone, or did they have a network of support which facilitated their ability to carry out a very complex plot. No one who has looked closely at the facts, including the individuals that I just named, has come to a conclusion other than that it is highly improbable that the 19 people could have acted alone. Yet, the official position of the United States government has been that they did act alone, and that there is no necessity for further inquiry into the question of whether there was a support network. "We're now in the 150th anniversary of the American Civil War, and we've had a national history classroom over the past few years, as incidents that were consistent with a date in the current era coincided with a date during that war. One of the pieces of information that we have learned, at least I have learned, is that President Lincoln had a policy throughout the war, that every message that came into the government, specifically into the State Department, was a matter of public record, on a daily basis. His feeling was that if the support of the American people was going to be maintained, in a war which was increasingly bloody, many loss of lives and loss of treasure, that it took the confidence of the American people, that their government was conducting itself in an appropriate manner, and that the key to that confidence was disclosure. "I wish we applied the Lincolnesque standard to what happened in 9/11. "The second issue, is the issue of justice. Some 3,000 members of the families who were lost on 9/11 have been trying for years to get justice through our system for the losses that they have suffered. The position of the United States government has been to protect Saudi Arabia, at virtually every step of the judicial process. When the United States government was called upon to take a position, it has been a position adverse to the interests of the United States citizens seeking justice, and protective of the government which, in my judgment, was the most responsible for that network of support. "Again, an example from the Civil War: The British had signed a neutrality agreement with the United States that they would not be involved in the Civil War. It was found out, subsequently, that in fact, their shipyards had been building military vessels for the Confederacy. After the war ended, the United States didn't forget; it did not walk away from the negative effects of Britain's perfidy. Rather, it pursued it, and finally, secured a recognition of what the British had done, and some compensation for the consequences of their actions. What a difference between the way this country saw itself as a prideful defender of justice for its citizens, and what we are experiencing today. "The third consequence is the issue of national security, and frequently those who have defended nondisclosure, have said, this cannot be made available to the American people, because it would be adverse to our national security. It will affect methods and sources of information, or other information that is inappropriate to be made publicly known. As the two Congressmen have just said, they both read the report — not 12 years ago, as I participated in writing the report — but they have read it recently, and have both come to the same conclusion that we did, a dozen years ago, that there is no threat to national security in disclosure. "I'm going to make the case today, that there's a threat to national security by non-disclosure, and we saw another chapter of that, today, in Paris. "The Saudis know what they did. They are not persons who are unaware of the consequences of their government's actions. Second, the Saudis know that we know what they did! Somebody in the Federal government has read these 28 pages, someone in the Federal government has read all the other documents that have been covered up so far. And the Saudis know that. "What would you think the Saudis' position would be, if they knew what they had done, they knew that the United States knew what they had done, and they also observed that the United States had taken a position of either passivity, or actual hostility to letting those facts be known? What would the Saudi government do in that circumstance, which is precisely where they have been, for more than a decade? "Well, one, they have continued, maybe accelerated their support for one of the most extreme forms of Islam, Wahhabism, throughout the world, particularly in the Middle East. And second, they have supported their religious fervor, with financial and other forms of support, of the institutions which were going to carry out those extreme forms of Islam. Those institutions have included mosques, madrassas, and military. Al-Qaeda was a creature of Saudi Arabia; the regional groups such as al-Shabaab have been largely creatures of Saudi Arabia; and now, ISIS is the latest creature! "Yes, I hope and I trust that the United States will crush ISIS; but if we think that is the definition of victory, we are being very naive! ISIS is a consequence, not a cause—it is a consequence of the spread of extremism, largely by Saudi Arabia, and if it is crushed, there will be another institution established, financed, supported, to carry on the cause. "So the consequences of our passivity to Saudi Arabia, have been that we have tolerated this succession of institutions, violent, extreme, extremely hurtful to the region of the Middle East, and a threat to the world, as we saw this morning in Paris. "So I conclude by saying, this is a very important issue. It may seem stale to some, but it is as current as the headlines that we will read today. It is an issue that goes to the core of the United States' contract with its people, that the people would give the government the credibility and support to govern; the government would give the people the information upon which they can make good judgments, as to the appropriateness of governmental action. It's as fundamental as justice to our people, who have suffered so, by this evil union of extremism and a very powerful nation-state. And it is the security of the people of the United States of America. "So, I again thank the Congressmen for their leadership. I hope that they will soon be joined by a rising tide of other members of Congress who recognize the importance of this issue. And then, finally, that the President of the United States will declare that he is going to adopt the Lincolnesque standard of full disclosure, and rely on the intelligence and judgment and patriotism of the American people to decide what the appropriate course of action should be. MATTHEW OGDEN: Now, the full press conference is available on larouchepac.com. This was live-streamed exclusively by the LaRouche PAC website, and I encourage you to watch it in full if you haven't already done so. And it is your job to circulate this broadcast as widely as possible to help to continue to build the overwhelming momentum on this issue; which has now already begun to accelerate over the last 48 hours with widespread coverage in the media, both nationally and internationally. Although this was the third such press conference that Congressmen Jones and Lynch have done on this issue, this was the first time that Senator Graham was personally involved. And I think that the combination of the timing of events with Senator Graham's physical presence on Capitol Hill this week, and the leadership role that he is now playing is of crucial importance in securing the crucial next step in this campaign; which is to get a Senate sponsor to introduce a companion resolution to H.Res.14, the Jones-Lynch-Massie bill. And the courage and the depth of Senator Graham's role in this fight, which was clearly reflected in the speech that you just saw, has already begun to have a radiating effect of optimism across the country and especially internationally; as people see that there is a viable source of leadership in the United States among people who are truly patriotic and have a depth of understanding of the principles and the history of our republic, and have the courage to defend it. Senator Graham's emphasis on what he called the "Lincolnesque" standard of Presidential leadership, the trust that's required between an informed and intelligent citizenry and their government, along with the direct parallel that he drew between the events of 9/11 and what he called "the British perfidy" in arming and supporting the Confederacy, I think is profoundly relevant to our discussion here today. So, to introduce somebody who has worked directly with Mr. LaRouche on the true story behind 9/11, and has personally been on the ground, behind the scenes you could say, for over a decade in the center of the fight to reveal the truth about what is contained in the 28 pages and elsewhere, I am happy to introduce to you Jeffrey Steinberg. So Jeff, why don't you come up to the podium? JEFFREY STEINBERG: Thanks Matt. I think that Senator Graham really set the framework for answering the institutional question which focused on this past several days' events in France. But I think the point should be clear to all of you by now that it's impossible to even begin to discuss those events without minimally going back to the 9/11 events, and the brutal cover-up that is followed. In other parts of the press conference on Wednesday, Senator Graham and I believe also Congressman Lynch made the point that when government documents are subject to classification review before being released to the public, very often there are redactions. There are names omitted, perhaps sometimes the names of countries are omitted, because there's genuine concerns about what they might reveal. Never has there been a document of the importance of the Joint Congressional Inquiry, where an entire chapter, virtually with every word in the chapter locked down and declared to be classified. And every member of Congress who has recently read those 28 pages, which was a fight in and of itself, has said that there's nothing that rises to the standard of legitimate national security concerns. What they do reveal, and there are important elements of those 28 pages that we do know about, they reveal, number one, that there was in fact an extensive support network that was operating in the case of at least the lead two hijackers, that's to say the first two 9/11 hijackers who arrived in the United States well over a year prior to the September 11th attacks. They were met at the Los Angeles airport by two men, identified as agents of the Saudi Arabian intelligence services; those two Saudi agents arranged their housing, arranged other kinds of logistical requirements, provided them with money, and actually set them up in the initial flight training. Now, during this entire time, those two Saudi intelligence officers were regularly receiving money to finance those activities. Some of the money came through a company that was an exclusive, private so-called, front for the Saudi Ministry of Defense and Aviation and one of those two Saudi intelligence officers was a ghost employee who received significant, not only salary, but expensive account funds, during the period that the 9/11 hijackers were being shepherded around and protected and financed. At least $50,000, probably closer to $70,000 came directly to the those Saudi intelligence agents, in the run-up to the 9/11 attacks from the personal bank account, of the Saudi Arabian Ambassador to the United States, Prince Bandar bin Sultan. Prince Bandar bin Sultan was a fixture in the United States for decades; many people referred to him as "Bandar Bush," because he had such an extraordinarily close relationship to the both President Bush 41 and President Bush 43. Bandar's wife, Princess Haifa was the sister of Prince Turki bin Faisal, who was the head of Saudi intelligence for over a decade, and who resigned from that position, two weeks before the 9/11 attacks. Prince Turki was one of the critical players who negotiated directly with Osama bin Laden and opened up the floodgates for Saudi funding to go into al-Qaeda during the period just prior to the African embassy bombings, the USS Cole attack, and then the 9/11 attacks. Now, I think that Senator Graham was very conscious of the juxtaposition of his comments about Saudi Arabia, the monarchy of Saudi Arabia and his references to the perfidy of the British monarchy during the period of the Civil War. Because, in point of fact, today, it's almost impossible to distinguish between the British monarchy and the Saudi monarchy: They represent a singular force, and were it not for the active and witting involvement of the British monarchy and British intelligence services, the Saudis would not be in a position to have played the kind of role that they played, in delivering critical support to the 9/11 hijackers, and many, many other similar kinds of activities. There is in fact a well-documented picture of the convergence of British and Saudi monarchical operations, that have direct bearing on 9/11. Beginning in 1985, Prince Bandar bin Sultan, although the Ambassador here in Washington, D.C., was the personal broker with then-British Prime Minister Margaret Thatcher, of a very unique barter agreement between the British and the Saudis, in which the British, through the BAE Systems major arms company, provided about $40 billion in various kinds of weapons, from fighter planes to radar systems, to the Saudi Ministry of Defense. The Saudis in return, paid for all of that military hardware, and some very hefty bribes that went to leading officials of the Saudi Defense Ministry and spread around among a number of other Saudi princes, by delivering 600,000 barrels of oil a day, from 1985 and in fact that program still continues to this day. Now, we did a little bit of work at EIR in crunching the numbers, and then we were supplied with certain critical confirming information from Prince Bandar himself. If you look at the amount of money that was spent by the British in providing those weapons systems, and then compare it to the amount of revenue that was generated by the spot-market sales of literally one supertanker of oil a day for a period beginning in 1985 and running through to the present, you'll find that after all of those factors were taken into account, there was well over $100 billion in funds left over. Now, in a recent sanctioned biography, Prince Bandar boasted about the fact that the special relationship between the Saudi monarchy and the British monarchy allowed for a series of offshore funds to be established — black funds, probably the biggest pool of covert operations money ever assembled at one time. And these jointly British-Saudi administered funds, as Bandar himself boasted, went to (quote/unquote) "the war against communism," by which he meant the financing of the Mujahideen in Afghanistan, which was one of the breeding-grounds for al-Qaeda and all of the other groups that we now see acting on the world stage. And so during period that Bandar and his wife were providing funds to the Saudi intelligence officers who were shepherding around two of the key 9/11 hijackers, Bandar was regularly receiving bank transfers from the Bank of England, which was in the form of his "broker's fee" for the oil-for-weapons agreements between the British and the Saudis — it was called al Yamamah; they called it "The Dove," translated into English from Arabic. So, Bandar's piece of that arrangement was, at minimum, $2 billion in broker's fees, that were coming into his bank accounts at Riggs National Bank. Those were the funds that were being shipped off to help finance the 9/11 hijackers. this is all a piece of what's in those 28 pages. We don't know it because we sneaked into the vault in the Capitol Building and got to read them; we know it because there have been other accounts. For example, Senator Graham wrote a book in 2004, called Intelligence Matters, and that book recounted his experience as the Chairman of the Joint House-Senate 9/11 investigative panel, and so he recounted anecdotally a number of the key findings that were then included in the 28 pages, that were blacked out by President Bush and Vice President Cheney, and which continue to be kept under wraps by President Obama, despite the fact that he promised the family members, the 9/11 families, on at least two face-to-face occasions, that he would make sure those pages were declassified. Now, there are many other factors, I am sure, that are included in those 28 pages, which dealt with the question of whether or not there were networks involved in backing up the terrorists, and where the finances came for the 9/11 operations. The name Saudi Arabia, names of specific senior figures within the Saudi monarchy and in the Saudi government are all over those 28 pages. I had an opportunity, during the press conference on Wednesday, to ask Senator Graham to give a brief account of another element of the 9/11 story: Coming out of the investigation into the San Diego, California cell where the Saudi intelligence officers were directly facilitating the activities and preparations of the hijackers, Senator Graham raised the question, whether or not there were similar support operations in place in other critical locations where the hijackers were doing the preparatory work. That included places like Sarasota, Florida, where Mohammed Atta and one of the teams were training and were operation; it included Herndon, Virginia; it included Paterson, New Jersey; there were other places. But those four locations, San Diego, Sarasota, Herndon, and Paterson, were critical centers for the entire preparations and staging of the 9/11 operation. Senator Graham was from Florida. He asked the FBI, at the point that he was chairing the Joint Congressional Inquiry for all files related to the investigations that were conducted in Florida, whether there was any indication of a similar support apparatus operating in that area. The FBI came back, repeatedly, and said no, there were no records, there was no such evidence. Many years later, basically in the last two years, through some work by investigative journalists, and through the filing of a Freedom of Information Act lawsuit, it was belatedly discovered that, yes, indeed, there was another support cell, this time, led by a very prominent Saudi businessman who was in the employ of the Saudi royal family, whose home was frequently visited by Mohammed Atta and the other hijackers. And lo, and behold, the FBI finally admitted that they have over 80,000 pages of documentation! That documentation was withheld from the Joint Congressional Inquiry, was suppressed and covered up for a dozen years; and now, for the first time, a Federal judge is reviewing that material. This now puts a much bigger spotlight on not only the Saudi, but the Anglo-Saudi element within the entire 9/11 process. Now, again, had that information come out publicly, Congressman Jones, Congressman Lynch, Congressman Thomas Massie, who's the third cosponsor of bill to declassify the 28 pages, have all said that, having read those 28 pages — and they've been very careful not to say a word about what they know of the content of those 28 pages, but they're free to give their opinions; and in all cases, they said that their entire view of the history of the last 15 years, and more, was fundamentally changed and shaken by what they read in those 28 pages. Now, here we are, in the beginning of 2015. We've just seen this horrific attack that took place in Paris, France, on Wednesday morning of this week. The United States is now supposedly an alliance, with Saudi Arabia, with Great Britain, and with other countries from the Gulf Cooperation Council in the Persian Gulf, Sunni countries, mostly monarchies, supposedly waging war against the Islamic State, ISIS. Yet, the evidence contained in those 28 pages, suggests that this Anglo-Saudi apparatus is the wellspring of all of the international terrorism that we've been facing over the last dozen years. Instead of revealing the profound and deep Saudi involvement in 9/11, all of the Saudis that were in the United States, including members of the bin Laden family, were the first people allowed on commercial airliners after the 9/11 attacks. Days after the 9/11 attacks, every single one of the people were rounded up and, not put in jail, not rendered, but were put on a commercial flight, and brought back to Saudi Arabia, safe out of the reach of U.S. law enforcement. So the cover-up has been persistent, and as the result of that, as Senator Graham just said at the press conference, there was a clear message: You can continue with impunity, because the United States will cover up for those British-Saudi factor. Now, the events several days ago in Paris, are still very much under investigation. It would be premature to wrap a ribbon around the story and claim that there's a clear picture of what was behind that operation. But certain things have already come out that are verified and clear: First of all, the two brothers who were involved as the attackers at the Charlie Hebdo office, who killed a dozen people, were part of a network, a recruiting network, a jihadist network that has been operating under the protective umbrella of the British monarchy, for a very long time. There are mosques in London, including the Finsbury Park Mosque, where the recruiters of those two [kouachi] brothers, were based and were for decades, protected by the British Crown and by British intelligence. One of the leaders of that mosque, Abu Hamza, was recently, in the last several years, extradited to the United States and was put on trial for his role in certain terrorist activities and terrorist recruitment, and his principal defense in court in the United States, is that, while he was there as a recruiter for al-Qaeda and other jihadist groups, he was also secretly working for British MI5, the equivalent of their FBI. And there's some reason to believe that there's a significant credibility to those claims. One way or the other, what you're dealing with here, is from the top down, an Anglo-Saudi apparatus that is the wellspring for the financing, for the training and for the protection of international terrorism, and so long as that truth remains concealed from the American people and from the world as a whole, there is no way to stop this terrorism; this terrorism will go on, uninterrupted, and yet, by simply exposing the truth, starting with the release of those 28 pages, we can begin to solve this problem in the proper manner. Now, I should just add one footnote: Because months before the 9/11 attacks, Executive Intelligence Review presented a dossier to then-Secretary of State Madeleine Albright. And the dossier basically called for the State Department to consider whether the government of Great Britain should be put on the list of state-sponsors of terrorism. [EIR, Vol. 27, #3, Jan. 21, 2000, "Put Britain on the List of State Sponsoring Terrorism"; http://www.larouchepub.com/eiw/public/2000/eirv27n03-20000121/ eirv27n03-20000121_052-put_britain_on_the_list_of_state.pdf] That dossier, which can be found on the homepage of the EIR website, was based exclusively on government documentation, formal diplomatic démarches that were filed with the British Foreign and Commonwealth Office, from governments as diverse as that of Egypt, Russia, Peru, Colombia, India — and in every instance the complaint was the same. That terrorism networks that were active in all of those countries, were being given safe-haven protection, logistical support, and financing, by the British government. In the case of Russia, there were mosques throughout the United Kingdom, that were hotbeds of recruitment to send wild-eyed jihadist recruits, first to be trained in Afghanistan and Pakistan, and then sent into the Caucasus to join with the Chechen networks that were carrying out a bloody terror campaign against Russia. In the case of Egypt, the Islamic Jihad group, that carried out the massacre of tourists at the Luxor historic sites in upper Egypt, was run out of London by networks that were financed and protected by the British government. So, the issue on the table, with those 28 pages, goes beyond just Saudi Arabia. It goes to the heart of the nature of the still existing imperial powers on this planet. And so, by releasing those 28 pages, and by unleashing an element of the truth, we not only have a unique opportunity to achieve justice, for the families, for all Americans, and for all victims of terrorism worldwide; but we lay the basis for shutting this apparatus down, once and for all. Because terrorism is not a "sociological phenomenon"; it's not something that is managed from the bottom up. Like the international drug trade, it is run from the top down, and all roads ultimately lead back to what even the British press refer to as "Londonistan." MEGAN BEETS: So, I'd like to briefly follow up more directly on the attacks in Paris, in the context of the larger picture that you just laid out, Jeff. Jacques Cheminade, a leading collaborator of Mr. LaRouche in France, who ran a very high-profile campaign for President during the recent Presidential election in 2012 in France, and who chairs the Solidarité et Progrès party, issued a statement yesterday in the wake of the initial attacks in Paris. "France is threatened. But we must not give in to the dictatorship of fear. To keep a cool head, the nation must be united around the need to fight terrorism wherever it rears its head and most importantly, to no longer tolerate the environment in which it flourishes. "We must demand an investigation into the role of the banking networks, especially the British ones, which act as transmission belts for the money used by al-Qaeda and Islamic State terrorists. These are the counterfeiters who keep these misdirected criminals going. "Only in a world without the City of London and Wall Street, and enlivened by the spirit of the New Silk Road on a world scale, the spirit of mutual development, can terrorism truly be fought. France can and must be a pillar of that new world." So, I think what Mr. Cheminade concludes with here gets directly to the point. Lyndon LaRouche has been very clear in placing the events we saw this past week within the context of the ongoing political and financial crisis, which is sweeping Europe and the United States, and the desperation which this has caused on Wall Street and in the City of London, which has prompted them to shift their drive for fascism and depopulation into high gear. At the same time, the Wall Street-owned Republican Party in the United States is using its new majority to attempt to slash social programs and ram through new bailouts for Wall Street. While Jeb Bush, the grandson of Hitler's financier Prescott Bush is launching his campaign for President. In Europe, Victoria Nuland's puppet Prime Minister "Yats" delivered an open apology for Hitler in Germany earlier this week, making a speech in which he actually stated the following — quote — "All of us still clearly remember the Soviet invasion of Ukraine and Germany. We need to avoid that it happens again." Mr. LaRouche commented that he should be called "Yatsi the Nazi." So Jeff, I'd ask if you could please paint for us the broader context within which the events that we've seen occur this week must be understood in terms of the financial and political breakdown ongoing. STEINBERG: Thanks, Megan. Before going into the heart of your question, I just want to make a point about the Wall Street element of this picture that we've been discussing so far. Probably about a year and a half ago, the Senate Permanent Investigations Subcommittee produced a 300-page report which traced out the role of one bank, a British Commonwealth bank, in laundering drug money into the United States and in financing international terrorism in partnership with corresponding banks in Saudi Arabia. That report centered on a bank called, HSBC, which was established during the middle of the 19th century, during the period of the British Opium Wars against China, and was for many decades known as the Hongkong and Shanghai Banking Corp. The bank was a centerpiece of the entire evolution of the global drug trade, and was openly the clearinghouse bank for international drug trafficking for many, many decades. The Senate report was comprehensive. It was extremely well-documented, and when that report was presented to the Department of Justice, the Department of Justice refused to launch criminal prosecutions. This has been the standing policy of at least the last two Presidencies, the Bush-Cheney Presidency and now the Obama Presidency, that Wall Street is so fragile, the City of London is so fragile, that were there to be even a single criminal prosecution of a Jamie Dimon or another leading Wall Street banker, the quote/unquote "collateral damage" would be so great that it would bring down the system. Now, Sen. Carl Levin, now retired, responded to a question from EIR at a press conference. And we said: Well, what do you propose should be done about this evidence of massive financing of drug trafficking and jihadist/Salafist terrorism by this bank? He said, well, you know, it's not our job to answer this question. Our job is to do the investigation and turn the material over to the Justice Department. He said, but I'll tell you very frankly, one of the options that we have available, is basically to remove that bank's charter. It should never have been allowed to operate in the United States while engaging in all of that criminality. Justice Department and the Obama administration and Wall Street and London saw it very differently: This was one of the crown jewels of the British Empire's financial system, and the facilitating of global drug-money laundering, which is indistinguishable from the financing of international terrorism, as we saw in the documentation that the same HSBC was partnered with Saudi banks that were part of the network of financing of al-Qaeda. The policy of the administration was, "let it go, because the system is so fragile that it would basically blow everything up." Well, this system deserves to be blown up, provided that there is a plan under way for an orderly bankruptcy reorganization which starts, here in the United States, with the reinstating of Glass-Steagall. Now, we're at a point right now where the war danger, and this is not a danger of local or regional war, this is a danger of world war, which would very likely turn very quickly into a thermonuclear war of extinction: Because the target is Russia and China. The motive behind this drive for war is exclusively the bankruptcy of the current London/Wall Street trans-Atlantic financial system. We've seen in the last several weeks, with simply the fact that the Greek government collapsed and new elections will likely bring in a new government in Greece, that will rip up the Troika agreement and probably will lead to Greece leaving the euro system, that alone is being openly talked about as the "Lehman Brothers/Bear Stearns moment" for Europe — in other words, the trigger for a blowout of the entire system. Similarly in the United States, the mere fact that the Saudis and the British are driving the competition out of business, in the oil sector, by driving prices down below the appropriate breakeven cost of production in most parts of the world, is in and of itself, creating tremendous ripples within the financial establishment, because the price of oil is the underlying foundation for a mountain of gambling debt, of derivatives contracts, of securitized debt obligations, all kinds of things, that amount to the tens of trillions of dollars. So the whole system is extraordinarily fragile and the only way that system is going to survive, is by either forcing China and Russia to thoroughly capitulate and open themselves up for absolute further looting, or, in the alternative, to go to war. Because under the fog of war, many of the financial instruments can be reorganized without having a change in political power. So we have a war danger: What happened in berlin earlier this week, when Yatsenyuk, who, remember, is Victoria Nuland's "our man Yats," his open promotion of support for Nazism, which is something that goes to the core: He's part of a Banderist apparatus from Ukraine, commingling with the Right Sector, with the Svoboda party, and that apparatus was aligned with Hitler during the war, and in Berlin, Yatsenyuk was absolutely vivid in his personal assault against Russian President Putin. He accused Putin of sending armies of bandits into eastern Ukraine; he accused Putin, with no evidence whatsoever, of being behind the hacking of government computer databases of the German government; in other words, you have wildly provocative statements coming out by people who are in a situation where their actions can very well be the precipitant for world war, because standing behind that, has been the creeping eastward expansion of NATO, and other actions; the deployment of the ballistic missile defense system into the southern tier of Europe; the promoting of color revolutions in many areas of the former Soviet Union, as well as the Middle East. So, because we are on the verge of a major systemic blowout financially, which can only be avoided by a systematic and orderly bankruptcy reorganization, putting Wall Street, putting the City of London out of business altogether, nothing short of that — which also probably means removing President Obama for his, now myriad violations of the U.S. Constitution — unless that course is taken, the danger of war is enormous and is growing by the day. So you have Wall Street, along with the Saudis, along with the British, continuously receiving signals from American governments over the last 14 years that they can act with impunity, and contrast that to what Senator Graham said about the need for a Lincolnesque Presidency, someone who knows that the truth and justice are the two cornerstones of the American constitutional system. I can tell you that, in the aftermath of that press conference on Wednesday, there was a tremendous spirit of optimism because people who've been disgusted by the behavior of the overwhelming majority of their elected officials for the last 14 years, once again saw a glimmer of hope, that there are elected officials that are prepared to fight for the truth, and for justice for the American people. They need to have their backs covered, and that's the responsibility of every one out there, to live up to each and every one of your responsibilities as an informed citizen of this country. It's going to take an enormous fight, but right now, the major enemy of the United States and the major enemy of the world, is Wall Street and London, the British Empire system. And it's high time for the United States to become, once again, the enemy of that oligarchical system, and use the real strength of the United States to bring system down. So that's the larger context, and that's why, on an even grander scale, it's important to understand that releasing, declassifying that 28 pages, is an existential issue for the survival of this country and the world, because we are on the cusp of a major financial blowout and we are on the cusp of a potential nuclear war. We're in graver danger now than we were at the height of the Cuban Missile Crisis in 1962. OGDEN: Jeff, do you want to mention the Hollande factor? STEINBERG: Oh yeah, there's one other thing I should mention: Which is, why Paris? Why France? If you take in the broad message that we've hopefully presented effectively so far this evening, one thing that should be clear is that the deployment of international terrorism is strategic. And in the case of France, right now, why target Hollande? Why target France? In the last several weeks, Hollande, who admittedly is a weak President, with very small popular support, has done something very important: He's broken ranks and has pushed back against the pressures from London, from Washington; he's done something that Angela Merkel has yet to do, he's said, "we must stop these provocations against Russia. We've got to stop pushing on the path for general war. No more sanctions. Roll back the sanctions and let's try to once again work on a cooperative basis with Russia." That has been a pushback, that has infuriated the British and their various allies and cowardly suckers around Europe and the United States. And so, there have been comments that I have heard in the last 24 hours, from very well-informed people, including in and around the U.S. government, who know what's going on; and they've said that basically, the attack against the Charlie Hebdo office, was actually a warning shot fired at the head of French President Hollande, warning him to back off from his efforts to get in the way of this drive for war. OGDEN: Thank you very much. Now, we have one final subject matter to take up in our broadcast tonight. As many of our viewers may know, the LaRouche movement is building a major international event which is upcoming a week from tomorrow, Jan. 17th: This will be occurring centrally in New York City, but this is part of our so-called "Manhattan Project." But there will also be parallel events happening in cities across the country; and this will be broadcast internationally via a live-stream that will be hosted on the LaRouche PAC website; it will also be translated into Spanish so our international viewers can also participate. Now, this event which is organized to occur on the weekend of Martin Luther King's birthday is part of the LaRouche movement's ongoing campaign to return the United States to its original founding principles, and to allow it to participate in the proper partnership that it deserves and must play in the new economic order that's being created by the BRICS. The invitation to this event begins with a very powerful quote from Martin Luther King's speech at Riverside Church, on April 4th, 1967, which was exactly one year to the day, before his assassination. The speech, was the one where he came out forcefully in opposition to the Vietnam War, and he stated, "We still have a choice, today, nonviolent coexistence, or violent coannihilation." Which is precisely where the world stands now, and it speaks directly to the point that Jeff was just elaborating: either the United States takes up Xi Jinping's offer to join this "win-win" cooperation along with the BRICS, or the world will destroy itself through global war. This is also precisely the subject of a petition which is now circulating titled, "The U.S. and Europe Must Have the Courage To Reject Geopolitics and Collaborate with the BRICS." And as of today, the list of prominent individuals who have signed this petition has now totaled almost 200. The newest signatures include several former members of Congress, including Rep. Rodney Alexander, from the state of Louisiana, and Rep. Donna Christensen from the U.S. Virgin Islands; it also includes former Sen. Mike Gravel, who represented Alaska in the U.S Senate from 1969-81, and achieved prominence through his courageous act of putting the Pentagon Papers into the public record. This list also includes former Rep. Cornelius Gallagher, who is known to some viewers of our website, also a very courageous man; and former Rep. Vance McAllister from Louisiana. Numerous other prominent political leaders, business leaders, academics, scientists, even artists from across the United States, and also from 20 different countries internationally, have signed this, countries, in Europe, South and Central America, Asia, far too many to list here. So this list must continue to grow and it's the responsibility of the viewers of this broadcast to reach out as widely as you can and recruit more people to join this campaign. Now, Mrs. LaRouche also thought it was very significant to emphasize an op-ed that has just been written by a professor in the Pennsylvania area, at Lincoln University, Dr. Ganga Ramdas, who teaches economics. And his op-ed is titled: "The U.S. Should Say Yes To the BRICS, and No To Wall Street Bailouts." It highlights the Chinese space program, the Nicaragua Canal, the New Suez Canal in Egypt, the high-speed rail projects being financed by China in Africa, and states: "The fact is that the Chinese and other BRICS countries are thinking and acting like America used to act when it functioned as an engine for economic and scientific progress in the world." And the author calls for the United States to return to this tradition, especially the tradition of FDR, to declare war on Wall Street, pass Glass-Steagall. And he concludes by saying: "In the same way that the Founding Fathers showed the wisdom to accept the French support in their fight to liberate themselves from the British Empire in 1778, we should accept the BRICS offer for collaboration in our fight to liberate the nation from the undue influence of Wall Street today. It is time that we, the American people accept the challenge to restore our tradition of scientific and economic greatness." Now, Mrs. LaRouche emphasized that it's precisely this type of statement that we need to inspire all those who are signing this petition to author and to write and to get that voice out there. So, to conclude our broadcast, I'm going to turn it over to Megan Beets to give us a brief overview of some of the scientific principles that Mr. LaRouche has been emphasizing, over the recent weeks, which must underlie what this new paradigm must be, and how we can think about the scientific principle behind what Xi Jinping has called this "win-win" system of harmony and mutual development. BEETS: So, let me just begin with a quote from a speech that Mr. LaRouche gave last month to an audience at the Dubna University in Moscow. He said, speaking about the developments, and the increased powers and capabilities housed within the nations of the BRICS system, "These nations are moving in a direction of self-development, of joint self-development, which can lead to a new conception, of the meaning of the human species and of our planet itself. Things lie before us, far in this system, things lie before us which have never been dreamed by most people on this planet, but if we are fortunate, we are a few steps in scientific progress toward the greatest leap that mankind has ever defined." And I think that that's the point of all of this. We are certainly not discussing, when we discuss the coming into being of the BRICS system, we're certainly not calling for reform of the current system — as you have made quite clear tonight, Jeff, the current system is evil, it's a system of Wall Street and empire. And in fact, Mr. LaRouche commented in a discussion earlier today, that the British Empire is collapsing and it must collapse. So we're not discussing that, but we're also not discussing returning to some prior, better system, which has already existed among mankind. What we have to realize is that today, were presented with an opportunity to remake mankind, to remake mankind and the society and organization of mankind, to be coherence with man's true nature, and to put civilization on the pathway of manifesting a rate of progress which has never been known beforehand in the history of man on the planet. Now, in order to do this, we have to come to understand, scientifically, and to put into practice, that which distinguishes man, absolutely, and fundamentally, from the beasts, and to make that conscious practice the dominant characteristic on the planet. Now, in recent weeks, Mr. LaRouche has highlighted the importance of a series of papers which he authored over the course of 2014, which are entitled, "Science or Self-Deception? "; The Satan Still Operating From Inside Bertrand Russell's Corpse"; "The Four New Laws to Save the USA Now,"; and finally, "From Kepler to Gottfried Leibniz,". Now, while each of these papers is unique, as a series, they center around defining the absolutely unique species-characteristic of mankind, as opposed to any other species known to us. And fundamentally, Mr. LaRouche locates that characteristic in the ability of man to search out and discover a quality of true universal principle, which is absolutely beyond and outside of the powers of mere sense-perception upon which animals depend. This characteristic has been seen in the greatest discoveries of the greatest minds in history, such as Johannes Kepler, and his discovery of the principle of the Solar System, which he did not discover by measuring and interpreting the data from sense-perception. Quite the contrary: It was only when Kepler was able to compose a unique contradiction among sense-perceptions, a contradiction of two measurements, with which both were true and yet which both could not be true, that Kepler created a crack, a great chasm over which only the mind could leap and only the mind could hypothesize the experience of the existence of something which was completely unknown before, a leap into the future. This is the quality of discovery which has characterized all of the great contributions to the progress of mankind in both science and in Classical art. Now, with this, we find two things: First, we find that man, as opposed to all animals which go extinct in time, man is not a fixed species, with a fixed species characteristic. Man is able to remake himself and his practice according to higher and higher insights into the organization of nature and to gain a new power over it. For example, we see this in the qualitative leaps upward, in power over nature which came with the discovery of nuclear power, man's mastery over the nucleus of atom. Now, secondly, we see something else: We see that the upward developments of the creative powers of the human mind per se, do not occur of the work of an individual, as we would tend to define an individual. It occurs as an unbroken thread of a process of progress over centuries of the contributions of great minds, each augmented by the achievements of the past. The progress of creativity on the planet has fundamentally reorganized this planet into a higher state of organization, than would have ever been possible by animal life, the biosphere alone. In fact, if we take a look at the magnitude of the development projects of the BRICS system, the ones already ongoing over the past year and the ones planned for the upcoming months, for example, both the magnitude and the rate of construction of the Nicaragua Canal and the New Suez Canal, we see exactly this taking shape. This unique principle of human life was recognized by a great scientist of the 20th century, Vladimir Vernadsky. Vernadsky spent a lifetime studying the geochemistry of the planet as it was changed and shaped by the action of living matter, the biosphere, shaped into new states, shaped into new concentrations of elements and materials, with changing chemical characteristics, all determined by the unified process of upward evolution of the biosphere as a whole, seemingly of separate systems of animals across the planet, across billions of years. However, Vernadsky concluded that it was not animal life, but it was the growth of the scientific thought of man, even though it has no mass and no special form of energy, the scientific thought of man is the most powerful cause for change on the planet, and reshapes it in ways which would have been impossible for animal life to achieve. Vernadsky also recognized that man was not limited to the planet, but what inherently a cosmic species in potential. Now, this principle of man's creative action, which was identified by Vernadsky, but developed much more deeply and fully by the insights of Mr. LaRouche, this is the basis today, for science and the practice of physical economics. This is the basis for Mr. LaRouche's insistence that it is the space program of China today, particularly, their commitment of the development of the Moon and the resources of the Moon, such as helium-3, which is the leading feature of man on the planet today. So, I would like to close by reading a short passage from one of Mr. LaRouche's papers, "Our U.S.A. Now Enters a New Era," which I think beautifully hits home at this principle of man's unique action within the Solar System. He says: " It is fair, and also necessary to say: that the human species makes its own future place voluntarily with respect to all other known living processes, but, also, absolutely, above each and every other species of living creature presently known to mankind. The fairly accurate description of that distinction, is that a human life, is governed, in its inherently natural design, by the necessity of an implicit progress of being a voluntarily upward-evolving species of the ontological characteristics of a human life, as distinct from all others presently known by us to exist, or have existed. The human species, therefore, always lives, actually, in the progressive development of its own future, to increase continually an ever-greater distance-in-principle from the beasts. This must be manifest, in fact, in practice: in a principle of constant anti-entropic change." So I think that that is the point, that man is a species of perpetual progress, and today, we have a great responsibility and an opportunity, to fulfill the contributions of those who have come before us, but I think especially to fulfill the potential of the great achievements which lie ahead. And it's critical today that we dedicate ourselves to winning the fight against the system of empire, to liberate mankind to be truly human, to manifest the natural system of mankind, and to be able to constantly come to a higher and higher understanding of what mankind is, and what mankind should and could be, in the Solar System. OGDEN: Thank you very much Megan, and thank you very much Jeff. I'd like to thank all of you for tuning into night. I'm going to bring a conclusion to our webcast here: We obviously have a very large responsibility, but I think we are fully equipped to carry out the task that is asked of us. So please, do everything that you can: Circulate this press conference as widely as possible, and stay tuned to larouchepac.com. Good night. March 11, 2014 Press Conference, Washington, D.C. The first Capitol Hill Press Conference calling for the declassification of the 28 pages, March 11, 2014. "As I read it, we all had our own experience. I had to stop every couple of pages and absorb and try to rearrange my understanding of history for the past 13 years and the years leading up to that. It challenges you to rethink everything." "President Obama, You're A Liar!" September 9, 2014 press conference on the 28 pages featuring H RES 428 sponsors and 9/11 victims' families. Just before Congress left Washington for the midterm elections, on September 9, 2014, Congressmen Walter Jones (R-NC), Stephen Lynch (D-MA) and Thomas Massie (R-KY), held their second press conference on the declassification of the 28 pages, urging their colleagues to co-sponsor their bill, H RES 428, which calls on the President to declassify the redacted section of the Joint Inquiry report. Joined by 9/11 victims' family members just days before the 13th anniversary of the attacks, the press conference was a devastating rebuke of Obama, who had promised the families that he would personally see that the report be declassified in 2009. An interview conducted by Matthew Ogden with former Senator Bob Graham in Naples, Florida on November 11, 2014. Senator Graham served as co-chair of the Congressional Joint Inquiry into 9/11. The subject of the interview is the urgency of declassifying the redacted 28 pages of the Congressional Joint Inquiry's report to expose the role of Saudi Arabia in financing not only the Al Qaeda attacks of September 11, 2001, but also continuing to finance ISIS and related terrorist organizations today. Investigative reporter Dan Christensen of the Broward Bulldog, as well as Miami-based first amendment attorney Tom Julin also participated in the interview. Christensen and Julin have been instrumental in combating persistent stonewalling by the Federal Bureau of Investigations in pursuing crucial leads pertaining to connections between a prominent Saudi family and a cell of 9/11 hijackers in Sarasota, Florida prior to the 9/11 attacks. I'm in, keep me connected.